Rightways: Attacks against Malaysian multi-billionaire Robert Kuok from UMNO leaders and Raja Petra uncalled for! PETALING JAYA: The recent attacks against multi-billionaire Robert Kuok, including those from Umno leaders and a prominent blogger, are regrettable, says MCA. 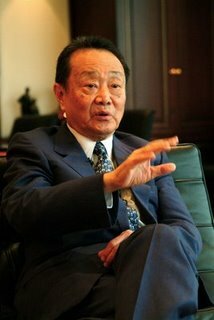 Party secretary-general Datuk Seri Ong Ka Chuan said it was a well-accepted fact that Kuok is a successful international entrepreneur. “Kuok has made tremendous contributions to the country. These comments are made to spread hatred and create disunity,” he said. Ong said Culture and Tourism Minister Datuk Seri Nazri Aziz has no right to request any Malaysian citizen to give up their citizenship. “This is not within his jurisdiction,” he said. Last week, blogger Raja Petra Kamarudin posted three articles in his website Malaysia Today, alleging Kuok was funding various political parties to overthrow the Government. In response, Kuok refuted allegations and that he would reserve the right to take action against the portal. MCA publicity spokesman Datuk Seri Ti Lian Ker concurred with Ong, saying there was no need to resort to harsh remarks against the 94-year-old tycoon. “MCA is of the view that Kuok is a businessman who has benefited Malaysians in general. “He is our business icon and revered by Malaysians from all ethnic backgrounds,”he said. Ti said Kuok has every right to support whichever political party and that there were existing laws to deal with any attempts to undermine the Government. “As a businessman, he could have supported many political parties and politicians from Barisan and Pakatan too. There’s no need to overreact by being ill-mannered in this instance,” he said. But Ti pointed out that all businessmen who have benefited from Barisan’s policies should be thankful and reciprocate with support. Two prominent Johor Barisan leaders – Tan Sri Shahrir Abdul Samad and Datuk Seri Dr Wee Ka Siong – came out to defend Kuok, saying they believed the tycoon would not interfere in national politics. Dr Wee dismissed Raja Petra’s claims as “unreliable”.